Melanie is a parent of a 4-yr old boy, Austin, who has cerebral palsy because of hypoxic ischemic encephalopathy. Shortly after her son’s birth she began coordinating fundraising initiatives to further research that could improve the quality of life of people with cerebral palsy She also serves as a board member of the CP NOW non-profit group, and parent representative to the University of Virginia’s Child Development and Rehabilitation Center (CDRC) driving efforts to provide the highest quality services to the children and families served in the University’s new children’s hospital. She also works a Customer Success Manager for GE Digital out of San Ramon CA, where she manages digital transformation initiatives and technology adoption strategies for enterprise food & beverage accounts. 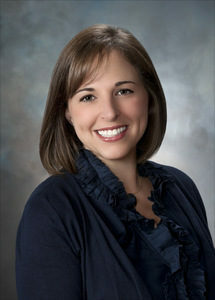 During her tenure at GE, she has also held roles of increasing responsibility as the Marketing Director for GE FANUC’s CNC business, as the Marketing Operations leader for GE Intelligent Platforms, Marketing Director for GE’s Control and Communication Systems business, and Marketing Director for GE’s Equipment Insight business. Prior to GE Melanie worked as a Product Manager for PBM Products, Inc. (now Perrigo), where she aided in the launch of the company’s first branded line of pediatric nutritionals and helped to expand business internationally by securing the company’s first accounts in Mexico. Melanie is a graduate of George Mason University in Fairfax, VA where she majored in International Studies with a concentration in Spanish. She now lives and works remotely in Scottsville, VA with her husband Josh, their older son Robert and their younger son Austin. In her spare time, she enjoys traveling and spending time with her family, visiting friends, going to concerts and live music venues and playing tennis.